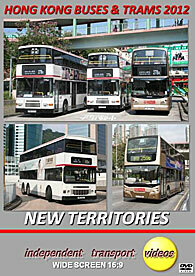 The third area of coverage of our visit to Hong Kong in 2012 is the New Territories. A large area to the west, north and east of Kowloon and bordering mainland China. There is a vast amount of variety for the transport enthusiast including the Light Rail system serving Tuen Mun and Yuen Long. Buses include those run by the MTR in both West Rail and East Rail liveries, as well as a good selection of vehicle types provided by the main operator, KMB and some appearances from Citybus, New World First Bus and the Long Win Bus Company vehicles. We start filming as we leave Kowloon behind onboard KMB AP67 (JU 3372), a Neoplan Centroliner to Tuen Mun. You can enjoy the sights as we travel along the busy Castle Peak Highway, which, as you will see is packed with buses! After filming the action in Tuen Mun bus station we board the Light Rail and travel on car 1091 built by Goninan of Australia to ‘Tuen Mun Swimming Pool’ and then onto the large ‘Ferry Pier’ terminus on car 1008, a Comeng built vehicle also from Australia – part of the first batch built in 1987. A good deal of tram and bus action is filmed in and out side of the terminus. From here we board a Kawasaki of Japan built car 1073, for a ride to Tai Hing. This interesting small town has the trams running through the streets, with boarding via high platforms. The main stop here is connected to a KMB bus station. Yuen Long is our next location. A good variety of buses is seen here, so look out for the KMB Enviro 400s on route 276 on their third day in service, as well as new E400s in MTR livery. Long Win and KMB’s Neoplan and MAN double deckers are seen operating alongside the familiar ALX500s, E500s and Wright bodied Volvos. Our cameras move north to Sheung Shui. Here we see a good number of white air-con Olympians and Dragons as well as some of the new single deckers. We see KMB’s new Enviro 400s on service 276 complimenting the ‘E300 Dennis Dart’ single deckers. Moving south we now film at Tai Po and Tai Po market and see the grey, red and off white liveried Enviro 500s of the MTR East Rail fleet. Immaculately turned out, it is hard to believe that these buses are three years old at the time of filming (they appeared on our 2009 programme when brand new). Our final location on this 2012 visit is Sha Tin. This busy town is served by two bus stations. We start in the upper one to see the buses arriving and departing before moving downstairs to the even larger under cover station which is below the New Town Plaza shopping centre for plenty of action. The filming took place mid afternoon, and we were lucky to capture a number of training buses running through. Non-air con Leyland Olympians and retired Dennis Dragons form the training fleet and these make a fitting end to this visit to the New Territories of Hong Kong. We hope you have enjoyed the experience!